Origin and Habitat: Tupiza to Impora, Mal Paso, Potosí department, Bolivia. Altitude range: 3670-3970 metres above sea level. 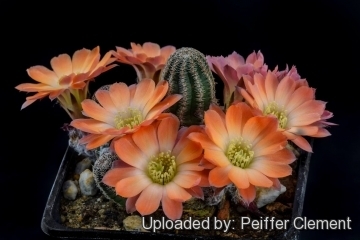 Description: Rebutia torquata (Aylostera torquata) is a local or morphological form of the widespread and variable Rebutia pygmaea. It has bicoloured flowers, red with a creamy-yellow throats and snaky ribs with areoles touching each other to form a striking continuous areoles strip. Plants are generally very uniform in size and colour of the flowers and in particular in the shape of the wavy ribs, that form an almost uninterrupted line of closely set areoles and spines. Derivation of specific name: Latin “torquatus, torquata, torquatum” ringed or collared, having a necklace or collar. Referring to the closely set areoles (less than 3 mm apart), that form an almost continuous line down the ribs' sides. Stem: Long columnar, 20-30 mm thick, green. Root: Large tap root that may exceed the size of the plant above soil level. Ribs: 8-10, straight to snaky about 3mm high, separated by shallow, broad furrows. The ribs are composed of very densely packaged tubercles, often touching each other to form a continuous areoles line. Areoles: 1 mm long, white. Spines: Only radial, 6-10, pointing sideward (pectinate), only about 1 mm long (sometimes 2 mm), white with reddish-brown base. Flowers: From the basal parts of the stem, about 30 mm long and 40-50 mm wide, red with a yellow throat. Bud dark green with small black scales, white woolly hairs, and (rarely) single hair bristles. Flower tube about 15 mm long, of which 3-4 mm thick, inside pale yellow, outside covered with hairs and larger black scales. Inner perianth segments about 12 mm long, 5 mm wide, spathulate, obtuse, apically red gradually turning pale yellow toward the base, outer perianth segments with shorter tip, equally coloured, almost black at the end. Filaments 6-7 mm long, green becoming yellowish at tips, developing all over the tube length. Anthers yellow. Style light-green, with 8 green stigma lobes, protruding about 4 mm above the level of the highest anthers. Fruit: Spherical, reddish, about 4 mm wide, covered with 1-2 mm long, narrowly triangular, dark scales and white wavy hair. Seeds: 1.2 mm long, 0.7 mm wide, black-brown. 1) Mosti, Stefano "Digitorebutia Buining & Donald (2)", Cactus & Co., 4: 95, 2000. 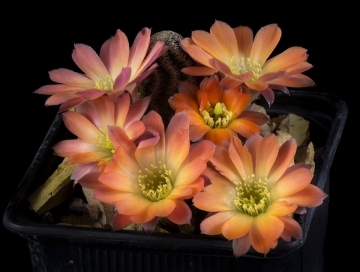 2) Pilbeam, John "Rebutia", p. 106, 1997. 3) Ritter, Friedrich "Kakteen in Südamerika", 2: 597, 1980. 4) Šída, Otakar "Rod Rebutia", p. 88, 1997. 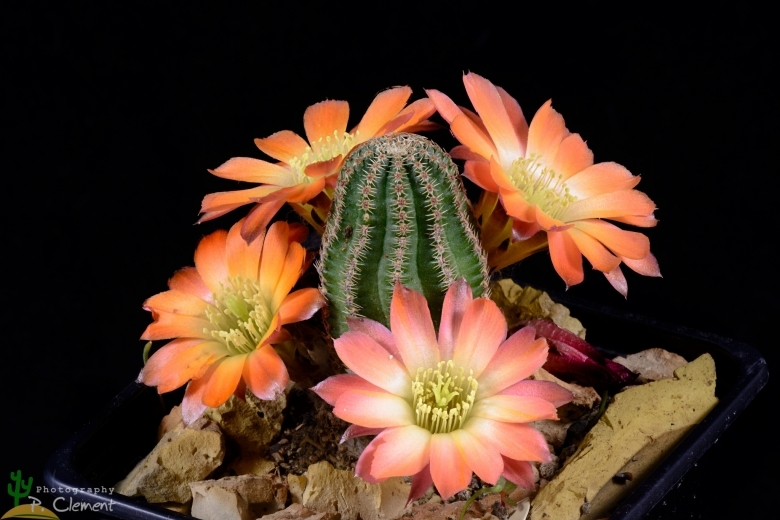 Cultivation and Propagation: Rebutia torquata is a summer grower species that is easy to cultivate and recommended for beginners. The whole Rebutia pygmaea complex has delightful flowers and the plants remain compact, and clumps can easily be managed by division. Another advantage is that the plants are very cold hardy in Winter if kept dry.